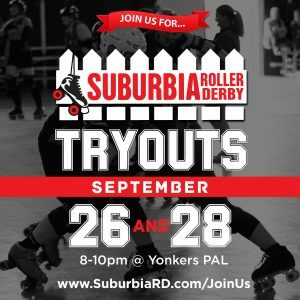 Are you interested in joining Suburbia Roller Derby? We are holding tryouts on September 26th and 28th from 8-10PM at the Yonkers Police Athletic League. We welcome skaters of any skill level, NO EXPERIENCE NECESSARY, 18 and older. Interested? Click here to find out more! Check out the Facebook Event here.